So, your bags are packed, you’re in the airport and you’re about to step on a plane heading for someplace warm, and then it hits you: you forgot to activate an “out of office” message for your email account. Well, if you’re using Gmail, good news: Gmail for Android just added an auto-responder feature that lets you set up an “out of office” message directly from your Android phone, no PC or Mac required. 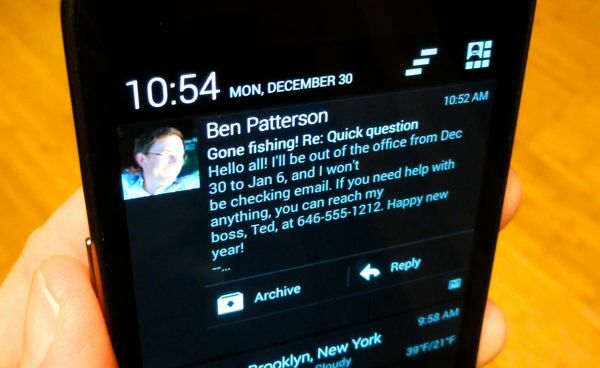 You can now set an out of office message directly from the (updated) Gmail for Android app. First, you’ll need to install the latest version of the Gmail app. Launch the Play Store app, open the sidebar (tap in the top-left corner of the screen) and navigate to the “My apps” section, then tap the green Update All button to install any pending app updates, including (potentially) Gmail. Next, launch Gmail, tap the three-dot menu button in the top-right corner of your screen, tap Settings, then tap the Gmail account for which you’d like to set up an “out of office” message. Tap “Vacation responder,” then enter a starting date, and end date, a subject line (“Gone fishing!”), and a message for anyone who tries to email you during your well deserved break. You can also check the box next to “Send only to my Contacts” if you only want your family, friends and colleagues to know you’re away. Flip on the switch next to “Vacation responder,” tap the Done button, then sit back and relax. You’re on vacation!